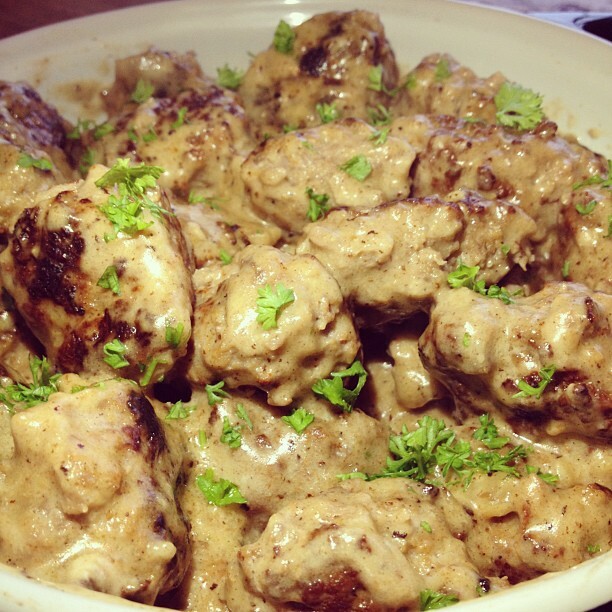 This Scandinavian classic, well known from being served in the cafeterias of IKEA furniture stores, combines ground meat and seasonings, served in a creamy sauce, is a delicious meal for all the family. Serve with mashed potatoes, pasta or noodles. In a bowl, soak the breadcrumbs in the milk until softened. In a small saucepan, add the minced onion to 1 tablespoon of butter; cook gently for 3 minutes. Mix the softened bread, cooked onion and ground beef. Add the eggs, salt, pepper, nutmeg and paprika. Mix thoroughly until very smooth and light. Shape the mixture into small balls, dusting your hands with flour while shaping the balls. In a large frying pan, melt the remaining 3 tablespoons of butter. 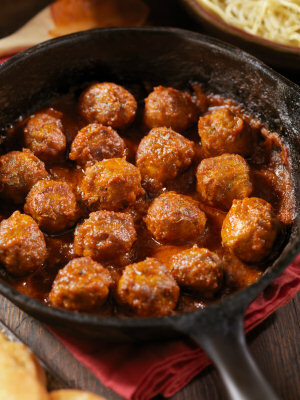 Add the meatballs and fry until golden brown all over; then remove the meatballs from the pan and set aside, keeping warm. Leave remaining butter in the pan. Add the flour to the frying pan; stir until well blended with the remaining butter. Add the water, and a few grains of pepper. Cook, stirring constantly until thickened. Reduce heat to very low and cook for 5 minutes. Stir in the sour cream, a rounded tablespoon at a time, stirring until thoroughly blended after each addition. Serve in a deep casserole, sprinkled with minced parsley. Serve the lingonberry jam on the side, or if you prefer, mixed into the sauce. If you can't find lingonberry jam, substitute it with cranberry or raspberry jelly. Liked this recipe got the most part, little to much sour cream for me but I would definitely make it again. Very good. I've tried several recipes, and this is without a doubt the best one yet. Be sure that you have rubber tongs to flip these with. They are very delicate. And oh so yummy! Average rating of 4.75 stars based on 4 reviews. Summary: This Scandinavian classic, well known from being served in the cafeterias of IKEA furniture stores, combines ground meat and seasonings, served in a creamy sauce, is a delicious meal for all the family. Serve with mashed potatoes, pasta or noodles.